Kurz notiert für die Bastler unter euch. 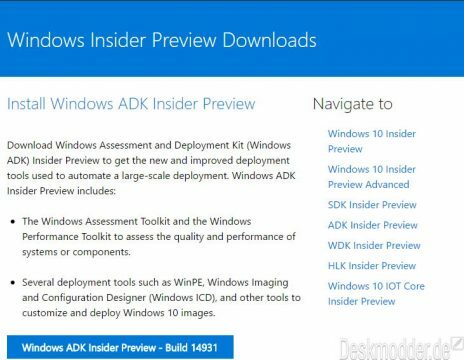 Neben der Windows 10 14931 Insider ISO hat Microsoft nun auch die weiteren ISOs bereitgestellt. Rasberry Pi, MinnowBoard Max, Intel Joule und DragonBoard 410c. Sowie die SDK ( Software Development Kit), ADK (Assessment and Deployment Kit) WDK (Windows Driver Kit) und HLK (Hardware Lab Kit) der Insider Preview. Alle weiteren Links sind im rechten Menü. This Windows SDK includes the following updates and additions to the Windows namespace since Windows SDK 14393. For feedback and updates to the known issues, please see the developer forum. The Windows Emulator ISO is not available for this build. You can install the Emulator for this build from here. The imported project “C:\program files (x86)\windows kits\10\bin\10.0.14931.0\xamlcompiler\microsoft.windows.ui.xaml.commontargets” was not found. Confirm the path in the declaration is correct, and the file exists on disk. Work around: Set the Min Version to a previously installed SDK, such as 10.0.10586.0.